Make this wonderful carry bag to take all your equipment, including cutter-boards and rulers, to your next class or guild day. 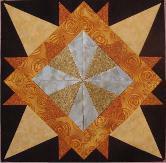 This is a three lesson class with the options of making two different blocks for each of the two large pockets, a beginner's blocks and an advanced block. Or if you are enthusiastic, you can make all four block. 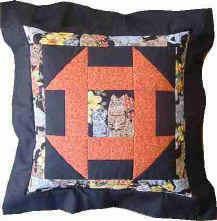 There are additional instructions on how to make any spare blocks into cushions or throw pillows. 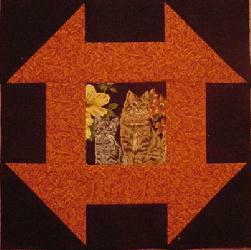 This class is also available as a pattern, only including two block instructions. Please note: Amounts are for full widths unless otherwise stated. 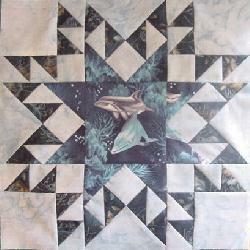 Directional fabrics can be hard to match in pieced blocks and would require extra yardage. 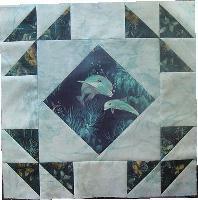 Requirements for blocks are given separately and are additional to Tote requirements. The colours given are for my blocks to give you an indication of where each fabric is required. I have given ample amounts in block requirements. You may find you have extra fabric from the tote fabrics to use in place of these or, if you are working from your stash, slightly smaller amounts may be enough. backing fabric for block – size of block plus 2"
batting – size of block plus 2"